We use only the Best European Quality Polished Stainless Steel Tube from Italian Steel Mills. Our Tube has a massive 1.5mm wall thickness for great quality A Bars. . The price includes one Chunky tubular City City Bar with Straight Profile for VW T5 that fix to original mounting points. These are a NON DRILL product. Our Front Bars and Steps are Hand Polished to a mirror finish. Chunky European Quality Stainless Steel. Why not look at our front Bull Bars and Front Nudge Bars Range! *Not compatible with vehicles fitted with a front spoiler. A really superb piece of engineering. Exudes quality, and easy to fit. Much safer and better looking than the other larger bull bars on the market - and more insurance friendly. Note that the two holed brackets are designed to be inserted into the large holes in the chassis where they then bridge the holes to enables the main bracket to be secured (not too clear from the instruction sheet but once figured out the fitting is a breeze). Excellent,great product and easy to fit. just as described easy to fit. 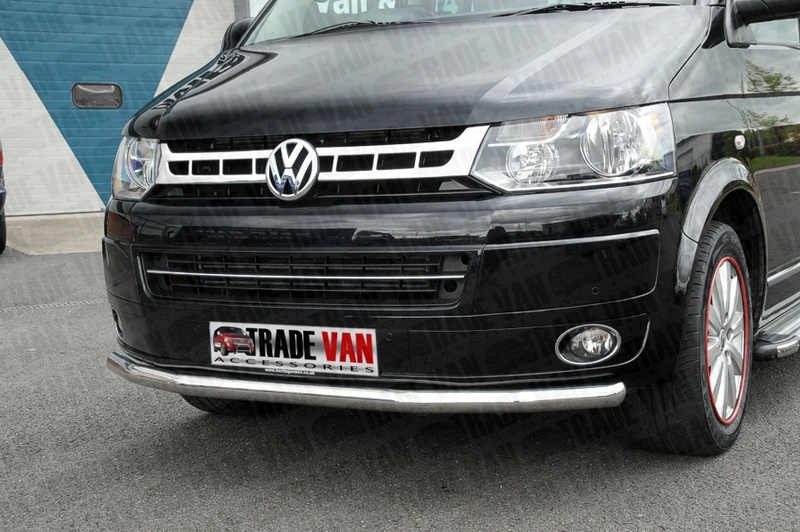 Click the button below to add the Front Nudge Bar ( City Bar ) Straight VW T5 Transporter Bull Bar 03-on to your wish list.